Twitter´s Blog just posted the results of a study conducted in partnership with Compete that tried to investigate the characteristics of the twitter users that will most likely to retweet: the Amplifiers. The results achieved by this study, that were posted by Taylor Schreiner, the co-head of the research ad, are of crucial importance, and can be super valuable to any business. As everybody knows, due to the way Twitter platform has reshaped the relationship between advertisers and their audiences, nowadays anyone on Twitter can become involved in real-time conversations with a brand. Twitter users can help extend a brand’s messages, as with every reply, favorite or Retweet, users drive earned media for businesses that can make a big influence on ROI. Which users are most likely to retweet a message on Twitter? And how can advertisers connect with them? The U.S. Twitter user who is most likely to retweet isn’t too diverse demographically from the rest of people on Twitter. Amplifiers come from all age groups, both genders, various income levels and similar geographic locations as the usual user on Twitter. Taylor Schreiner First Tip for advertisers is: “When you create campaigns on Twitter, don’t limit your potential earned media, as Amplifiers can exist across all your potential audiences”. Amplifiers use Twitter several times a day, twice as likely as mainstream Twitter users. They tend to use Twitter on a mobile phone (54%). The research found that amplifiers are twice as likely to use Twitter during their travels or when they socializing with friends. Second Tip: “Maximize the engagement of your Twitter campaigns by targeting users on mobile devices and increasing the likelihood that you reach these amplifiers. Tweet content that is easy to consume and share on the go. Test day parting your Tweets to better understand when your followers are most inclined to retweet”. As Amplifiers are more actively engaged with Tweets than the average user, they are both strong content consumers and creators. Amplifiers are more likely to send Tweets (86%), send direct messages (122%) and favorite Tweets (102%). They are also highly visual as they view photos on Twitter (90%), tweet photos (107%) and tweet videos (89%). 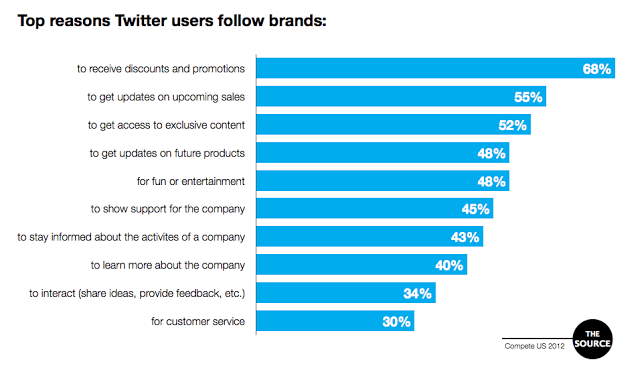 If the average Twitter user follows five brands, amplifiers show significantly more interest in brands. In fact, amplifiers are twice as likely than the average Twitter user to follow more than 20 brands on Twitter. According to Bluefin Labs, 95% of the public social conversation around TV happens on Twitter. Amplifiers tend to tweet about what they are watching on television. The research found that 90% of amplifiers tweet about TV shows. They are also 36% more likely to be in front of the TV whenever they tweet.